The A149 coast road will take you to Morston, a village of brick and flint houses that sits between Stiffkey to the west and Blakeney to the east. Turn off the coast road onto the track (signed) that will take you to the pay and display parking area. 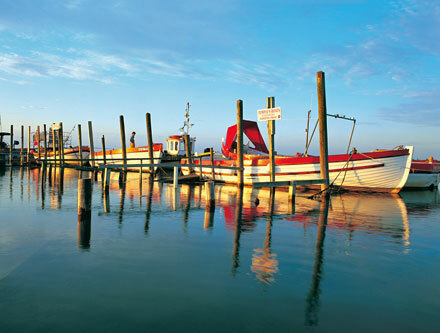 Morston Quay provides moorings for ferry and fishing boats and a launching point for dinghies and water skiers’ powerboats. Mooring posts line the edge of the creek as it meanders in across the saltmarshes. In the summer months, just before high water, it becomes a hive of activity with the dinghy sailors rigging their boats and tacking out into the large expanse of water called Blakeney Pit. Blakeney Point is a long sand spit that juts westwards into the sea. It is an important breeding and wintering area for many species of seabirds and wildfowl. The Point is cared for by the National Trust and a warden is a permanent resident during the summer months. Small ferry boats (seal trips) ply from Morston to the Point taking holidaymakers out to view the resident colony of Grey seals. The seals start having their pups in October and the breeding season ends in January. During that period landing on the Point is restricted. The saltmarshes hereabouts yield a local delicacy, ‘samphire’. This plant, which grows freely on the marsh is simmered until tender, soaked in vinegar and eaten with brown bread. The taste? It’s like salty asparagus. You will see roadside stalls where samphire can be purchased at a very reasonable price. Set off from the car park eastwards along the grass bank towards Blakeney. The high bank gives a good view north across the marshes and creeks. In the south the land is agricultural, rising gently towards the village of Langham. Where the bank bears to the right keep straight on down the steps and follow the path to the buildings ahead. In the distance, Blakeney church can be seen on the high ground south of the village. A light is permanently on in the tower of the church as a reference point for sailors looking for the entrance to Blakeney channel. The path enters Blakeney at the end of the Quay. A more substantial quay this, reflecting Blakeney’s past as a once busy seaport. The channel has silted up over the years and is only navigable by smaller boats. The village’s economy now relies on tourism to survive, and at the height of the summer, the car park on the quay fills quickly. 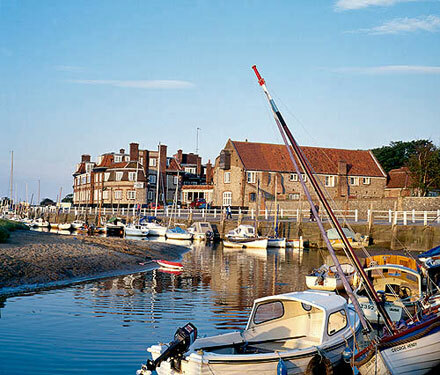 An off-season break in Blakeney can be very rewarding. You will avoid the crowds and be able to enjoy the tranquillity that the winter months bring to the area. An autumn or winter stay in a North Norfolk holiday cottage, the Blakeney Hotel or Morston Hall, is a very relaxing and enjoyable way to spend a weekend, particularly for keen walkers and birdwatchers. Behind the car park at the eastern end of the quay is another grass bank serving as a flood defence. Walk out along the top of the bank. The path loops around back inland. 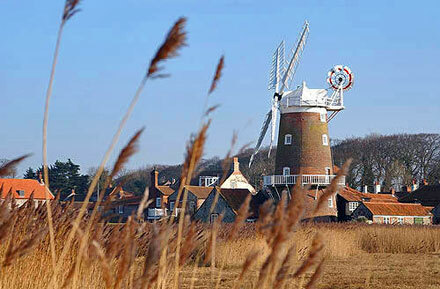 Ahead you will see the striking landmark of Cley Mill standing on the edge of the reed beds. Stay on the bank. You will join the coast road at the sluice gate on the River Glaven. Continue into the High Street of Cley-next-the-Sea. I would advise a pause and a look around the village. There is an excellent pottery, delicatessen, bookshop and art gallery. Also on the High Street is the smokehouse where tasty locally caught fish is on sale. Tearooms and the George Hotel provide for the thirsty walker. In the summer months, there are clumps of brightly coloured hollyhocks at the ends of the lanes that lead up from the main street to the highest part of the village. At the southern end of the High Street, a passage leads to a path along the sea wall. During the summer, the scent from rose bushes planted at the edge of the gardens that border the path is very noticeable. You will round the corner and walk alongside the creek towards the mill. As you approach the mill, look for the cream coloured building on your right that was once the custom house. At the top of the building, you will see what appears to be a small attic window. That was where the duty excise officer had his telescope to inspect ships as they navigated into what was then, like Blakeney, a thriving port. In 1406 James, son of Robert Bruce, King of Scotland, on a voyage to France was driven into Cley by foul weather. Having been detained by the local mariners, he was sent as a prisoner to London. Diverting slightly from the route you could call at the visitor centre of the Norfolk Wildlife Trust. This exceptional facility has a good tearoom, a viewing terrace, a shop and an educational building. With the mill on your left climb the steep steps towards the sea bank and follow this to the car park at Cley beach. The car park borders the Cley Marshes Nature Reserve. The reserve is internationally important and is managed by the Norfolk Wildlife Trust. Avocets breed there and many unusual species pass through, some blown off course by storms when migrating. Ospreys are regular visitors. The walk from Cley Eye is along the beach or just inland of the shingle bank. This section is approximately 5kms in length. Watch for the birdlife on the marshes. The shingle bank was formed at the top of the beach to protect the marshes and the villages of Cley and Salthouse from the winter seas. The bank has been severely battered by winter storms, and the policy of the Environment Agency is no longer to replenish it, but to let nature take its course. In the distance across the grazing marshes, is the village of Salthouse. The beach here shelves very steeply, and there is deep water close inshore. The water is so deep into the beach that it was considered a possible invasion point during the last war. It was heavily defended, and mines are still occasionally uncovered by the pounding of winter seas. There is a beach road to the village should you wish to visit. The Dun Cow public house at Salthouse is popular with visitors as is the rather eccentric seafood restaurant called Cookie’s. Both are at the edge of the village green and during the tourist season parking can be a problem. Continuing along the beach, you will come to a grassy hillock on the shingle bank called Gramborough Hill. From this point, the walking becomes less tiring because you are leaving the shingle and will be walking on firmer ground. Keep on until you reach the end of the shingle bank at Kelling Hard. Cross the car park and follow the path towards Weybourne. As you approach the village, you will see a reminder of Weybourne’s military past – a revolving radar dish, an element of the MoD’s early warning system. The radar site borders onto what was once a military encampment where anti-aircraft gunners were trained, firing the weapons at targets towed along just offshore. The camp was operational until the late fifties. Some of the original buildings have been utilised as a museum of military hardware known as the Muckleburgh Collection – a name taken from the large hill next to the museum site. For a meal or a drink at the end of the walk, I suggest a visit to the Ship Inn at the bottom of the main street near the church. The food is excellent and reasonably priced. I am confident you will enjoy this walk along a short stretch of the beautiful coast of North Norfolk. It is as rewarding in many ways during the winter months as in the summer. Wrap up warm though because the winter winds can be bitterly cold.